The staff was very helpful and have gone extra miles to help us. Our rooms are comfortable. The staff at the front desk spoke fair amount of English and knew thier job. Very friendly and smiling all tge time. Good noise insulation, very quiet . friendly staff. Convenient store next to the hotel and good restaurants nearby and you have shopping mall (carrefour) , hotel staffs are friendly and good service. It is a bit far from Metro Stn. Getting Taxi is not easy. Preu qualitat correcte ! esta situat a 15 Minuts amb Taxi de Hongqiao Airport i a 10minuts de la Fira NEC . Zona Tranquila i varis restaurants a peu de l´Hotel. res a dir.. preu qualitat Ok,. 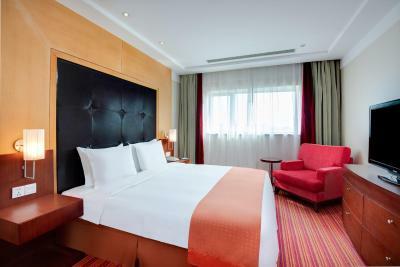 One of our top picks in Qingpu.A 15-minute drive from Shanghai Hongqiao Airport, Holiday Inn Express Shanghai New Hongqiao offers modern rooms with free Wi-Fi. 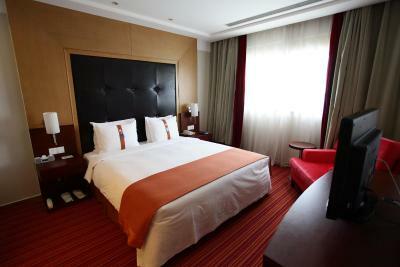 A well-equipped 24-hour business center and a restaurant are some of the facilities available. 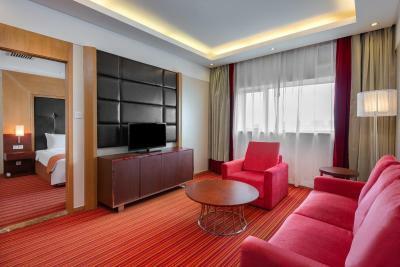 Featuring plenty of natural light, rooms include a mini-bar and a LCD TV with cable channels. 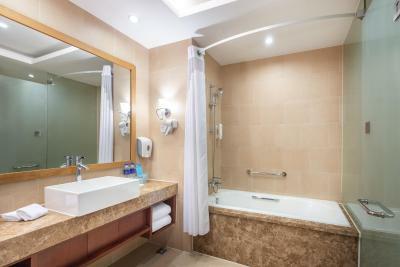 Attached bathrooms come with a rain shower. 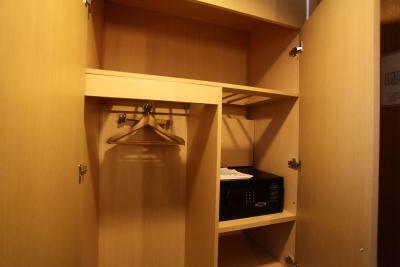 A 24-hour front desk provides luggage storage. Other services include and ticketing. Drinks and snacks are sold at a vending machine, located in the hotel’s lobby. A Chinese buffet breakfast featuring congee rice porridge and noodles is served daily at Haojiaofu restaurant. Western dishes are also available. 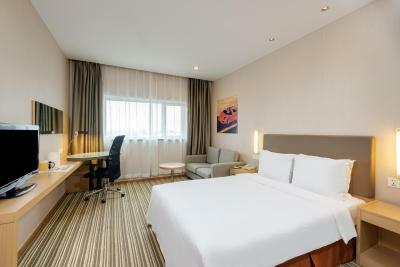 Holiday Inn Express Shanghai New Hongqiao is 12 mi from People Square. Qingpu Outlet featuring global brands is a 10-minute drive away. 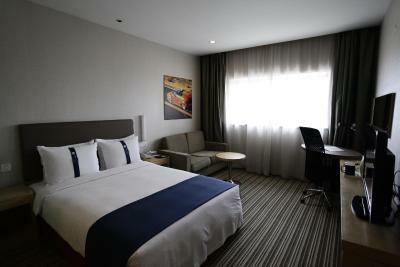 When would you like to stay at Holiday Inn Express Shanghai New Hongqiao? 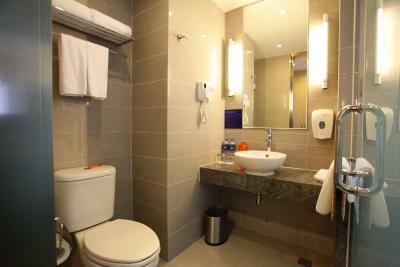 Nonsmoking room comes with a mini-bar, ironing facilities and a bathtub. Free internet access is provided. Room comes with twin beds, a flat-screen TV with cable/satellite channels, an electric kettle and an private bathroom with a shower. 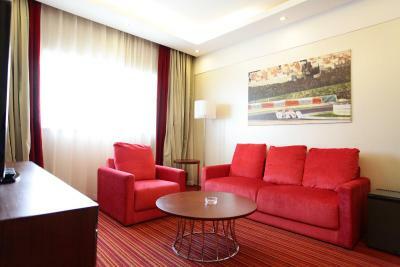 This suite has air conditioning, sofa and soundproofing. 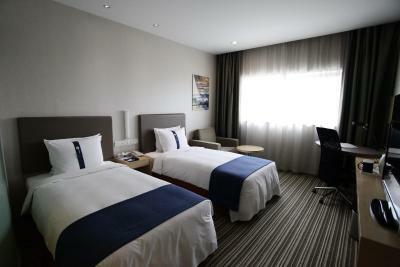 Holiday Inn Express Shanghai New Jinqiao is located in Jinqiao Export Processing Zone. It is within short walking distance to Waigaoqiao Free Trade Zone and Shanghai New International Expo Center, nearby China Pilot Free Trade Zone and 30 minutes’ drive from Shanghai World Financial Center. It is within 20 minutes distance to the upcoming Shanghai Disneyland Resort. 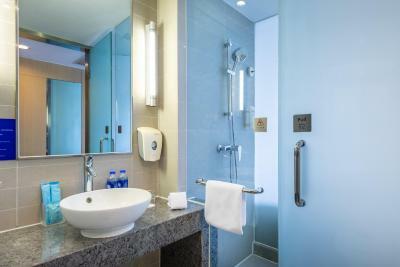 House Rules Holiday Inn Express Shanghai New Hongqiao takes special requests – add in the next step! Free! All children under 19 years stay free of charge when using existing beds. Greatwall Holiday Inn Express Shanghai New Hongqiao accepts these cards and reserves the right to temporarily hold an amount prior to arrival. Holiday Inn Express Shanghai New Hongqiao accepts these cards and reserves the right to temporarily hold an amount prior to arrival. We paid for a room online. When we went there they gave us a different smaller room. They told us we had to pay twice the amount for the room that we paid for. They told us it was this website's fault and that we need to complain with "booking.com". This must happen a lot. The workers already had their excuses prepared. I even saw one of the workers that was observing trying to hold in her laugh. Online still shows the same promotion but the hotel does not honor the bookings. That aside it was just an OK place. We even found water stains (it looked like they cleared out mold) next to the bed. Also the heater took forever to make the place warm. The highest it reached was 22 degrees even though we set it to 26. Will never stay here again. Agree with most comments about the breakfast. Mostly Chinese, and a few basic Western options. I would like to see a big improvement with cleanliness of the breakfast area. Maybe new clean furniture and updated aplicances. Weird thing- they always used to shut down aircon facility for the reason of overall cold temperature outside. It was around 28 degree c outside and they call it cold. Had to argue with management many times to switch on the aircon. Booked the hotel because aircon was one of the facilities they promised while booking. Carpet is quite dirty . We originally booked the room through IHG web for 2 rooms, and it was confirmed. However, when we checked in , the receiption told me that only 1 room is booked, and so the other room will be charged at a higher rate based on walk in price. We complained to hotel manager, and it was resolved quickly finally. Other than that, it was good for short stay for work. Buffet could have been very much better, same variety everyday and waffles are already been made and not ready to make hot one for you if you request too. 90% Chinese food and only 10% continental food.